As “Rennies,” aka regular patrons at renaissance festivals, we know we’re going to be there from opening cannon to close (and beyond). Each trip to RennFest requires various necessities, especially with children, from medication to snacks to cushions (for sore behinds or sleepy children). One thing that many Rennie families bring is entertainment; we love our performers and favorite songs, but even we can be played out after days (or weeks) of the same. Our children enjoy the digital age, but sometimes that conflicts with the “faire mood,” so we’ve become fans of tabletop games. Of course, RennFest is an outdoor festival with limited table space and a need for portability. No one is bringing Settlers of Catan, Ticket to Ride, or Scythe to faire, or if they do, I’m both shocked and impressed. Thus, we depend on “travel games,” entertainment that comes in small packages, limited components, and yet provides plenty of fun or strategy. What follows are my ten favorite games (in no particular order) to bring to RennFest, whether because they’re easily carried, easy to play (or teach), or just fit the mood. Don’t worry if you don’t see yours on here or disagree; as always, these are personal tastes, and there are still a lot of great games out there. I love cooperative games, especially those with a twist – in this case, you don’t even know what your cards are and must rely on the hints of your friends. Antoine Bauza’s Hanabi uses this ruleset as players attempt to create the best fireworks display with their cards. Hanabi is easy to learn, making it great for families, from elementary school children to grandparents. It’s also fast, with most games lasting less than 30 minutes. As the basic version contains just cards and a few tokens, Hanabi is perfect as a travel game. Deluxe or special versions are still portable, but the tabletop “footprint” grows with some of them. We wrote about Keith Baker’s Illimat before and how it was based on game band’s play on the road. Although the prop came first (and the game was designed later), Illimat retains that “travel” game quality from its box to its components. Like “trick-taking” card games, once you know what you’re doing games are fast. Even with additional rules and the occasional “strategic” play, most of our games lasted around a half-an hour. I continue to adore Illimat’s “replicantique” appearance, with its unique cards, bronzed pieces, and imagery. This game fits well with renaissance festivals, Victorian masquerades, and other “costumed” affairs. Deck-builders may be more complicated for more casual players to learn, but I believe they make great travel games. Robert Dougherty and Darwin Kastle’s Star Realms is a good example, where players are competing as galactic groups fighting over bases and ships. Players build their core decks by trading for new ships and bases, while simultaneously building enough combat to knock an opponent’s Authority down. The CCG feel in a deck-builder makes this game more familiar to those who’ve interacted with the former game more. Although people’s boxes are compact, I warn that Star Realms can take up a bit more tabletop space than some games. This “footprint” grows with expansions, so make sure you have the room where you’re playing! I continue to enjoy the relaxed feel that Eduardo Baraf’s Sunset Over Water provides, reflecting the painters as they strive for the best landscapes. Although a competitive game, the peaceful theme hides this fact; we’ve found older friends and family loved this game for its pleasant demeanor. In addition to a low complexity (but excellent strategy), Sunset Over Water is also rather quick. Games are usually done in under 30 minutes, which makes it great for a lovely outdoor distraction. Sunset Over Water is pretty compact, from its box to even game setup. We’ve played on some relatively small tables, although you still need a bit of room. Carl Chudyk and Chris Cieslik’s Red7 is like if Uno decided to have a psychotic child that went on a rampage. A game with multiple rulesets in the same session, players must complete their current goal, or they’re out. Red7 is super fast, with hands lasting under a minute and games often done before you have a moment to think. Easy to learn, the changing ruleset allows for a lot of replayability and variance between sessions. Like many card games, Red7 is compact and takes up minimal tabletop space, making it perfect for travel. It does get a bit competitive, so make sure you’re not interrupting others around you! Speaking of shifting rulesets, Andrew and Kristen Looney’s Fluxx has been a staple of our table for decades. An ever-changing game where players use their cards to change the ruleset, the game lives up to its name. Fluxx games are easy to learn, but the rulesets can make things super-complex. Some games might end in minutes, others have gone on for nearly an hour. I really enjoy the variety of versions of Fluxx, which sometimes add a unique twist and allow for the perfect theme for wherever you are. This game also has a compact box and “footprint,” making it ideal for small groups and tables. By now, Phil Walker-Harding’s signature game has graced many players’ tables, and it’s no different when you’re at a festival or out camping. With an easy-to-learn playstyle, a family-appropriate theme, and high portability, we sometimes find multiple groups with a copy on them. Sushi Go! is a fast game with some competitive strategy, as the “pass and play” style and specific goals make you think about your hand. Even the younger kids at the table showed an aggressive manner and proudly displayed their favorite sushi rolls. If you want a bit more to the game, you can pick up Sushi Go! Party; it’s practically the same game but with more cards, a few tweaks to rules, and a larger box. I still prefer the original, just because it’s super-compact and it’s hard to squeeze more than four people at a small, outdoor table. Shannon Kelly designed a winner with this theme of nightmares and dreams. The artwork and general “story” are fantastic and macabre, as players delve into their dreams but risk becoming the monsters within that realm. Gameplay is decent enough, lasting no more than 30 minutes, and it’s not a very complex system. Also, this is one of the smallest footprints, as everyone is limited to their card, tokens, and dice bag. One small problem with Lucidity is the number of components, particularly easy to lose ones. All those beautiful dice tend to disappear, especially if you’re playing outdoors. The main “worker placement” travel game, Justin Blaske’s Mint Works is all about business but a lot of fun. Like its namesake, players are competing companies, using limited workers to acquire more, build buildings, and become the best. Although the theme doesn’t lend itself to younger players, who might grow bored, the rules are easy to pick up and games often last around 15 minutes. Like Lucidity, however, all those components tend to get knocked over or dropped. For gameplay, however, I really enjoy being able to do a worker placement game while on-the-go or out somewhere. Not to mention, its cool packaging in a faux-mint container! Like Dominos, John Yianni’s Hive is a tile placing game that takes up minimal footprint. In fact, the tile-placement is part of the setup and the gameplay. Players are “hives” attempting to box the opposing queen in, while preventing the same from happening to them. There’s a lot of strategy and replayability, and this game has high portability; in fact, they also have a pocket version, as if the original wasn’t compact enough. 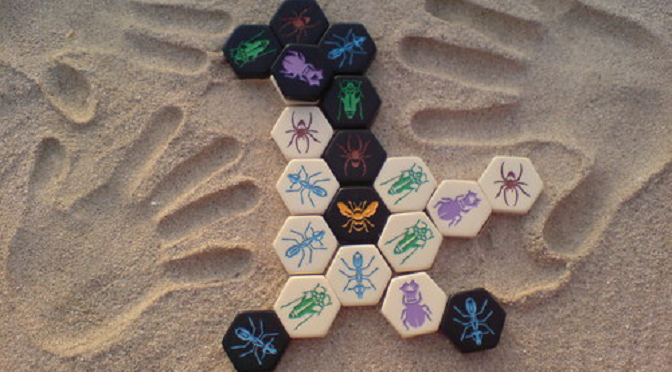 The one downside to Hive is it’s two-player only, which limits its use in larger groups. Still, it’s easy to learn, perfect for kids to adults, and useful in just about any playing situation. As I said earlier, there are plenty of games not on this list that are just as much fun. These are merely my current favorites, and ‘tis the season for outdoor events and occasional vacations. Regardless of where you are or who you’re with, there’s always time to squeeze in some game time. 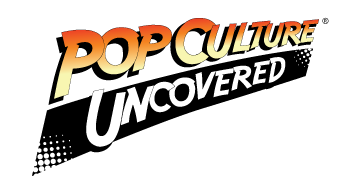 Why don’t you tell us your favorites in the comments below?